Will super region rankings come out on Tuesday? Usually that’s been the day.. Here is my final predictions on the SR4 rankings. Lots of teams fighting for playoff spots lost today so the field has narrowed. To me, the talent in teams really drops off after commerce and SCSU is the biggest mover. With the Tarleton-Midwestern game being the only H2H game left of these 10 teams, baring upsets, I think we’re really looking at 1-8. 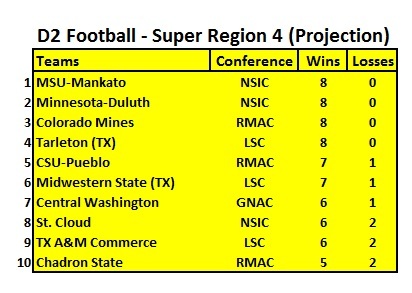 I just don’t see either SCSU or Chadron passing a 2 loss Commerce or a 2 loss Midwestern. (and CWU isn’t a really a two loss team, they’re D2 record is 6-1 with the other loss to an FCS school). If Tarleton wins I could see them end as the 2 seed, Mines as the 3, and UMD as the 4 (their SOS is gonna plummet the next three weeks). Would be pretty incredible to have 4 undefeated reams in one SR! Should be a good last three weeks of the season! Keep in mind that CWU may drop due to SOS. WT lost last night to Eastern New Mexico and the still have Commerce and Midwestern on their schedule. Chadron plays at CO Mines still. Exactly, the only way SCSU moves past those teams is if midwestern andcommerce just lose some games and SCSU runs the table. Midwestern likely loses to Tarleton, MW is out if that happens. No, I think Mines and Pueblo would still be the RMAC teams. Mines would only have 1 loss. That’s true for sure. I just think that they will put a one loss CWU in if they run the table in the GNAC as opposed to leave the conference out. Over the years the “committee” has also seemed to refrain from having first round inter conference games, tho if three LSC teams get in with 9-1, 9-1 and 8-2 records I’m not sure it can be avoided. I still think it comes down to Pueblo, Mines, CWU, Mankato, Tarleton, UMD, TAMUC and Midwestern. RR should come out later this afternoon....that said, my 10 sec look at the teams records and quick SOS....I'd guess something like this..
Tarleton has only played 7 games and I’m shocked to see SCSU at 8. They’re Still technically in it so I was expecting top 10 but not #8! Encouraging for the NSIC! Good point....I had in my head they were 8-0. Either way, I have them still at 4. SCSU has a higher SOS per my quick look at the numbers..keeping in mind this doesn't take into consideration they got blow out in their 2 losses and such. That said, I'm expecting Commerce will get every benefit of the doubt when it comes to eyeball judgment, since they are the defending champs..thusly though of highly by most. Mines plays Chadron in the coming weeks....BSU vs SCSU as well. MW State vs Tarleton is the biggest single game remaining. This isn't to dismiss USF at Mankato in 2 weeks..but USF just isn't on the list here.